Confused about your rights as a student in transition? Have questions about school practices, responsibilities and the law? Looking for resources and contacts? Need expert opinion and guidance on school-related issues? Want to connect with other students and families? As part of its commitment to demystifying the transition process for adults with disabilities, Independence Northwest is partnering with Disability Rights Oregon to bring you a great resource in the month of October. 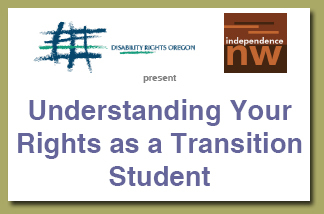 Susana Ramirez, the Special Education Advocate for Disability Rights Oregon, will be presenting “Understanding Your Rights as a Transition Student”. The training is designed for students and their families as well as professionals interested in learning about increasing their advocacy skills. Join us Wednesday October 27th from 4 – 6pm at the Independence Northwest office located at 541 NE 20th Avenue Suite 103 in Portland. We’re just off Glisan and 20th in the Jantzen Building. Please take a moment to RSVP so we know you’ll be joining the conversation. Contact Summer Rose at Independence Northwest via phone (503.546.2950) or email (summer.rose@independencenw.org) to register. You can RSVP via Facebook here. This presentation is FREE and light refreshments will be served. Susana Ramírez has been advocating for the rights of children and adults with disabilities with Disability Rights Oregon for the last 9 years. Susana brings a skill set combining her personal experiences as a parent advocate at the state and national level and her professional expertise in special education law and community organizing.